The Hague, Holland. It's a bit misty. Joseph from behind the bar brought a pistacho. George Shearing notes. It set the sphere. and "Getting To Know You." "Do you think we stay together?" They played, "Kisses Sweeter than Wine." St Valentine smiled down that Day in 1951. I'll be her VALENTINE and AD-MAN. 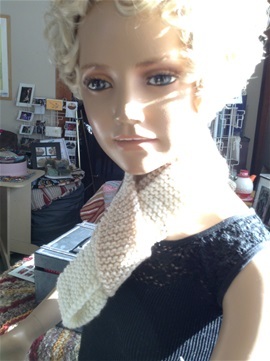 She made SKINNY INFINITY SCARFS. On display and sale this Sunday, Feb. 18th. safe and sound. Priced at 29.95 Cdn. Mud Lake Entrance and Yacht Club. Not Cafe WIM but..cozy place. What else? Deep in the history of Canada. Cafe WIM books still there.